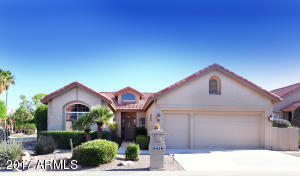 LARGE corner lot with beautiful desert landscaping and close to the walking path that winds throughout the community. This two bedroom, two bath home has been extended with additional square footage in the family room. NEW CARPET throughout and neutral tile. Updated granite kitchen counters with island and refaced kitchen cabinets with a breakfast nook for casual dining. This home offers a large great room and separate spacious area for living/dining. RO and Soft Water. Refrigerator (2 years old) conveys with washer and dryer. Updated master bath with granite, walk-in-closet and large shower. Plenty of room for two cars PLUS the additional golf cart garage. Attached storage cabinets/shelving in garage. You will LOVE the backyard with extended patio that is south facing. RESORT LIVING!